In 1970, a jury convicted Robert Hillary King of a crime he did not commit and sentenced him to 35 years in prison. He became a member of the Black Panther Party while in Angola State Penitentiary, successfully organizing prisoners to improve conditions. In return, prison authorities beat him, starved him, and gave him life without parole after framing him for a second crime. He was thrown into solitary confinement, where he remained in a six by nine foot cell for 29 years as one of the Angola 3. In 2001, the state grudgingly acknowledged his innocence and set him free. This is his story. It begins at the beginning: born black, born poor, born in Louisiana in 1942, King journeyed to Chicago as a hobo at the age of 15. He married and had a child, and briefly pursued a semi-pro boxing career to help provide for his family. 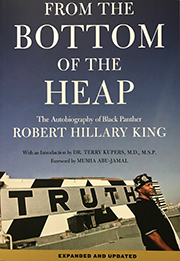 Just a teenager when he entered the Louisiana penal system for the first time, King tells of his attempts to break out of this system, and his persistent pursuit of justice where there is none. Yet this remains a story of inspiration and courage, and the triumph of the human spirit. The conditions in Angola almost defy description, yet King never gave up his humanity, or the work towards justice for all prisoners that he continues to do today. From the Bottom of the Heap, so simply and humbly told, strips bare the economic and social injustices inherent in our society, while continuing to be a powerful literary testimony to our own strength and capacity to overcome. Told in a straightforward manner, this gripping tale has humor and all the innocence of a child’s voice, a more mature young man’s, evolving finally into the voice of an adult trying to plant his flag in ripe soil to claim a piece of the planet for himself and his kin. It is a testimony to Robert King’s fortitude that he is able to eloquently recall the worst 29 years of his life. For a person to go through 29 years in one of the most brutal prisons in America and still maintain his sanity and humanity, that’s what makes people want to listen to Robert. The case of the Angola Three has the potential of laying bare, exposing the shortcomings, in the entire US system. Friendships are forged in strange places. My friendship with Robert King and the other two Angola 3 men Herman Wallace and Albert Woodfox is based on respect. These men, as Robert reveals in this stunning account of his life, have fought tirelessly to redress injustice, not only for themselves, but for others. This is a battle Robert is determined to win and we are determined to help him. When there is a train wreck, there is a public inquiry, to try to avoid it recurring. Robert King’s conviction was a train wreck, and this book is perhaps the only way the world will get to understand why. There are more than 3,000 people serving life without the possibility of parole in Angola today, some as young as 14 when they were sent there, and many of them innocent but without the lawyer to prove it. We owe it to them, and others in a similar plight around the world, to read this book.